When I am setting up a new user in “active directory users and computers” I like to find a similar user and copy their account. This way I can set the account up faster and I am less likely to miss something. But for the past few months, I have been fighting this active directory error “the name reference is invalid” when trying to copy an account. I always seem to be in a hurry when this pops up so I try another account to copy and if I have no luck I just set it up from scratch. But today I had enough so I started to dig into what was going on. 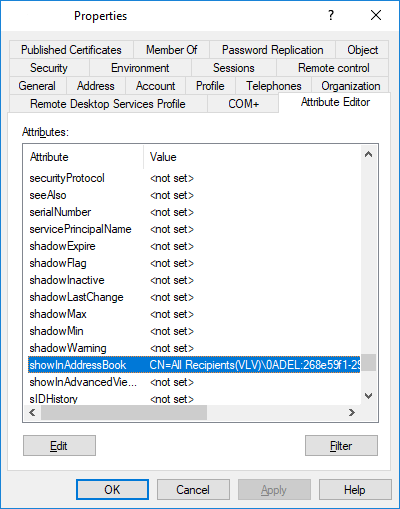 Windows cannot create the object “Username” because: The name reference is invalid. This is the dreaded error I always got. Other people in my department got the same error as well so I knew it did not have anything to do with my computer. Don’t you just love how Microsoft manages to put no helpful details in their error messages? It turns out for us at least the problem was an entry in the “showInAddressBook” attribute of the user we were trying to copy. It looked like this. After removing that value the copy function started to work again. I am guessing it was some legacy thing from an old server because it only seemed to be a problem with older accounts and not new ones. Maybe from when we moved to Office365 but that is just a guess. I hope you found this article helpful! I am constantly posting new and helpful things I learn so please subscribe to my newsletter for the latest information and exclusive content. This entry was posted in Tutorials and tagged Windows on March 27, 2018 by Zack.